Eureka Spitfire 2 is Eureka’s 2 pole hoop style tent, that houses two people and has a very light weight of 4lbs. It is probably the lightest 2 person tent on the market with a lot of room left for gear. It has a lot of the same features as the solo model you see above this one expect. Spitfire 2 has a larger base and can fit more people inside of it. The Spitfire 2 tent features a bathtub floor, meaning that it is ultra seamed and almost impossible for the interior of the tent to be damaged from dampness or wetness. Perfect for those rainy days of camping! There is more than enough room for two people you could even fit three at a tight squeeze. Inside the tent there are two mesh gear pockets for additional internal storage which is very handy for flashlights and cell phones. Like the smaller model before it, the Eureka Spitfire 2 features DAC Feather Lite aluminium poles which are very light and durable. Additionally its also worth nothing that this tent only needs two stakes to be set up. That is it! Which is incredible when you consider how big the tent actually is. The poles attach to the main frame of the tent via locking pole tips and grommets for unbelievable fast set up time. Spitfire 2 tent works well for a lot of people as if covers a lot of bases. It is big enough for two but you have to be careful on pack and gear space. After all, if it is raining outside you don’t want all your wet stuff in the tent with you. The all-clip side and use of only two stakes in setup make it one of the easiest two person tents to erect. It also has side release buckles for easy take down too! This tent comes in one color. A shiny grey metallic color, which is good for trying to find it from a distance. But if your plan is to hunt you are going to want to look elsewhere for a more suitable color as this one is quite bright. Big, simple, easy to set up and take down. Cost effective and very light. Good in most types of weather. Untested and could be sturdier in harsher weather conditions. Very small pack size-only 17 inches. Fabric is a little flimsy, will wear over time and get caught in the zippers. 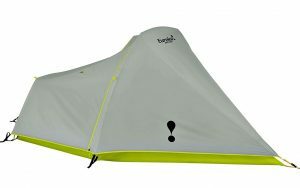 Overall Eureka Spitfire 2 review; It is very basic, no thrills tent. It’s big enough. It does what you need it to do. You will be comfortable and you will not get wet. Nothing dangerous about this purchase and in addition if it is your first time buying a tent, this is the one you are going to want to purchase. It is well made, simple, and easy to repair and does everything you would need it to do. It’s a safe option. You may also like to read our top peak best 2 person tent available in the market.